“I particularly liked the session about building a data science team where I learnt about the rapid growth of IoT devices and the shortage of data science jobs despite huge growth. Also, learning about the high rate of churn for graduates in their first 5 years in the industry and their top reasons for leaving and how companies can help lower this turnover. Another session I really enjoyed was by the lead data scientist at carsales.com and the engaging and humorous presentation explaining their image recognition algorithm. I also met several people in the industry and was introduced to their technologies which I found very interesting. I found the discussion very helpful particularly concerning preparation for interviews. I think Jack Rejtman did a great job of moderating the discussion and getting the students involved. It was also a great opportunity to bond with my fellow students and discuss ideas and opinions as the day progressed. In all it was a fine day and a great opportunity to get a taste of the world outside of University,” Callum (Bachelor of Science). “The day was an extremely interesting one for me, and it presented an incredible insight into the culture of the Data Analytics industry depicting the differences between the culture of Academia shown at the University. Attending this conference caused me to realise that I should not only concentrate in improving my technical skill but in fact focus on improving my "soft" skills. During the day I observed that the accomplished individuals did not only have immense technical ability, but also showed a strong sense of emotional intelligence and throughout the day it was evident that the more balanced an individual was the more successful they had been throughout their career. These are the type of experiences that make me more certain in the career choices I have developed during my university studies,” Andrew (Bachelor of Science). “I found the people at the conference to be friendly, welcoming, fascinating and engaging. I met and made a few new contacts who gave me tips on career progression, fields of study, employability skills and where the industry was headed. While the talks at the conference were largely aimed at decision makers in corporations, they gave an interesting insight into the state of data analytics and data science, how they are being used in the business world, and what new innovations were emerging. The Q&A session set up for the data science students was particularly enlightening, as the people who choose interns and graduates to receive programs told us about what they look for and how we can best set ourselves up to ace that dream interview/application,” Isaac (Bachelor of Science). 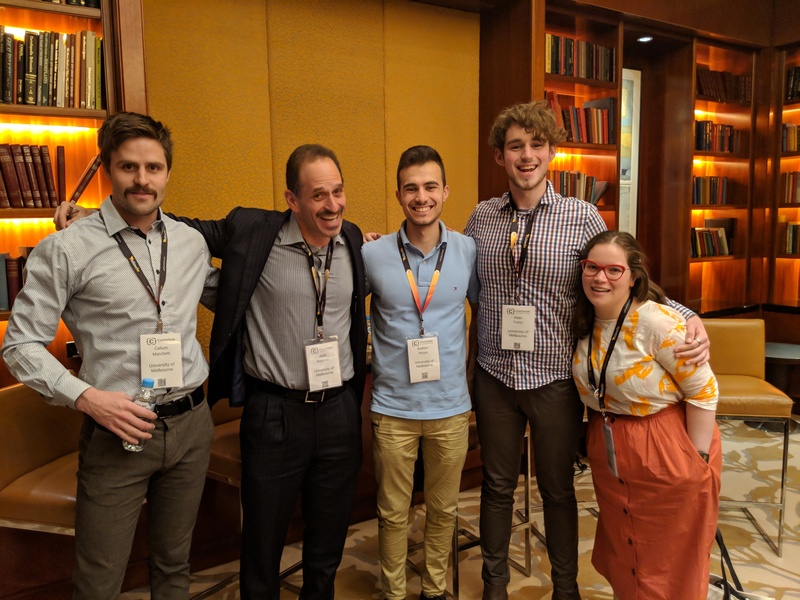 “I really enjoyed the experience of attending the Chief Data and Analytics Officer Melbourne conference as it provided an insight into what a career in data science could look like. Seeing my studies and what I have learnt in class outside of the class context and that it is being used in the field was amazing. The talks and panels were great but another highlight was during the breaks when one could talk to people at booths about their products, the company and hearing what a day in the life is like for a data professional. It was also so nice literally having a seat at the table to discuss what grads want from workplaces and how to land your first professional job, such great advice from the panelists and also Jack Rejtman as the host. I hope to see more opportunities like this for both employers and students.The conference was an enlightening experience to see what it could be like to go into data science and I like it! Plus the food was delicious and the freebies at the booths were also on point,” Emanuela (Bachelor of Science).